Photography literally means ‘recording with light’ and without light all we’d have would be piles of black pictures. For most people the sun provides all the light they need for their pictures. When shooting indoors we need to introduce artificial light to illuminate our subjects. Artificial light comes in many forms, from your living room’s ceiling light to a halogen spot or even your fridge. But these are rarely strong enough or directional enough for photography, so more often than not we have to turn to using flash, whether it be from a built-in flashgun or a separate unit. Basic flash is a fully automated affair requiring little input from the user, but results can often be disappointing. To get more out of flash requires some knowledge of how it works, and of the techniques and gear available, and that’s where things get tricky. That’s where we come in. Over the next few pages we’ll look at the types of flash available, and a few of the dozens of ways to use them. We’ll help you to understand exactly how your flash works, and know it’s capabilities and limitations so that you can more fully explore the joys of lighting your subject more effectively and subtly. Whatever your camera and budget there’s a flash that will fit your needs. All compacts, and most DSLRs, have a built-in flash unit and for most people this will provide their first experience of using artificial lighting. h, on a DSLR, pops up out of the pentaprism. Most provide only direct flash, with no facility to bounce the light from a wall or ceiling, though the unit found on Panasonic and Leica cameras does offer an upward tilt position to allow this. Built-in flash units typically have a Guide Number of around 10-14m so are okay for subjects reasonably close to the camera, but are not powerful enough to cover large groups of people or great distances. Usually they are limited in the control they offer and won’t accept accessories. 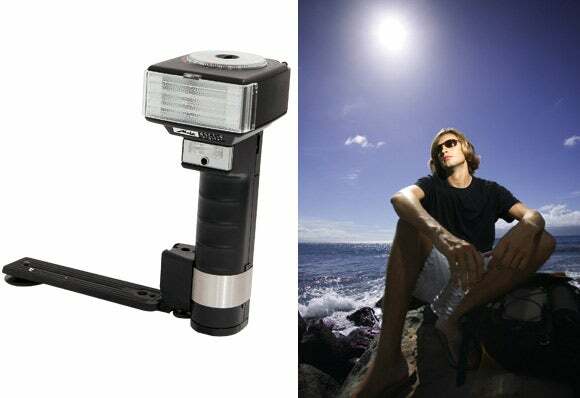 The most popular type of flash is the standard hotshoe-mounted flashgun. With a range of different models available from the camera manufacturers and independents, there’s a wide choice to suit all needs and budgets. Even the most basic models have more power than a built-in flash, and compatible models work with the camera’s TTL metering and AF system to automatically provide the optimum exposure. The cheaper, basic units have a fixed head, while more advanced units also offer swivel and tilt heads, along with automated zooms to match that of the focal length of your lens. Manufacturers now also offer wireless operation so single or multiple flash units can be used off-camera for more control, especially in large interiors or on location. So called because of their shape, these attach to the side of the camera via a bracket which screws into the camera’s tripod bush, while a dedicated TTL module and cable connects the flash to the camera’s hotshoe to provide AF and TTL metering – though manual operation is often possible via the traditional PC socket. Hammerhead guns offer features such as tilt and swivel heads and sometimes secondary tubes, but their main advantage is their sheer power, and by being further away from the lens axis, redeye is virtually eliminated. 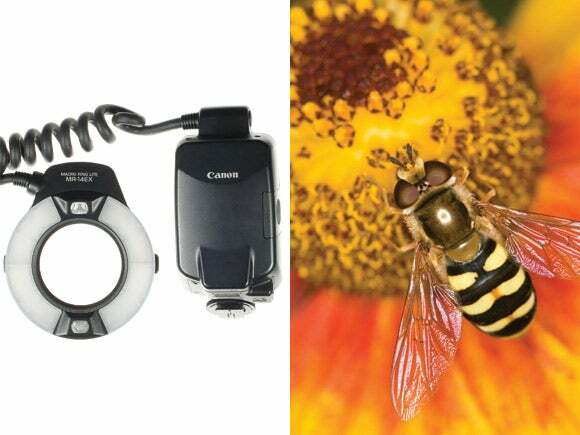 Originally designed for macro photography, ring flashes fix around the lens, with a connector to the hotshoe, and provide a flat, even light on the subject. Since the 1980s they been popular with fashion photographers because of the effect they have on skin, and in providing a silhouette shadow all around the model. 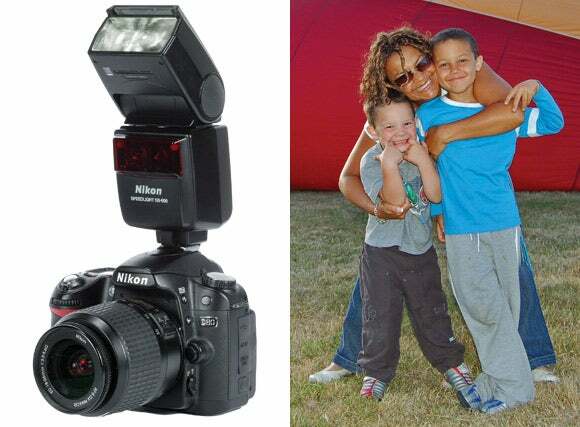 An alternative to the ring flash, especially in macro applications, is the twin/macro flash, which uses multiple units around the lens, which can often be individually adjusted to control the modelling and shadow on smaller subjects, in a way that would be hard to achieve even in the studio. Traditionally associated with the professional studio, there are a number of lower-priced studio systems available to anyone with a spare bedroom and a desire to have absolute control over the lighting in their pictures. Studio flash are much higher powered than small flashguns and accept a range of softboxes, brollies, grills and reflectors to not only control the power of the light but also the quality, spread and hardness of light. Effective studio lighting can be achieved using either a single light or multiple heads and can be used for a host of applications, from still-life to portraiture and even location shooting.